If you would like to introduce coding in your school, write us! We will do everything in our power, to make Learn IT classes available to your children. Our curriculum is tailored for students of grades 1-9 without prior knowledge in coding. 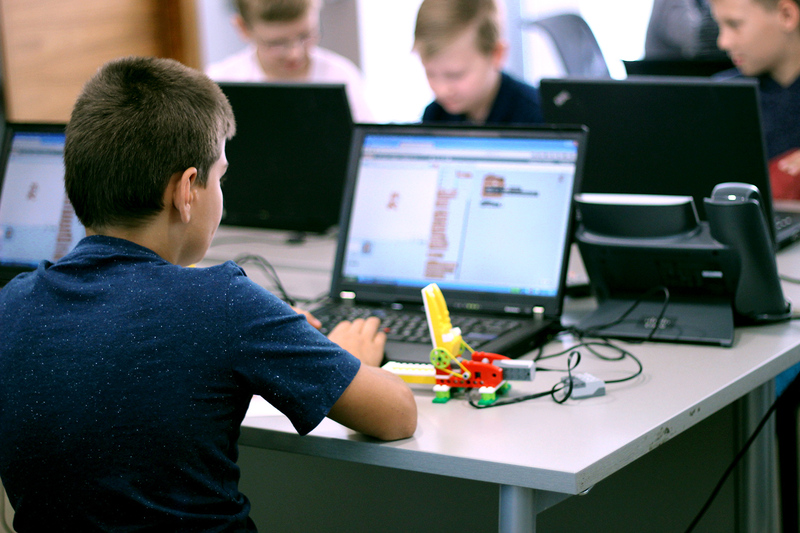 During the classes, students create games, mobile apps and websites, solve tasks to develop logic and control robots. Classes for the youngest students aimed at developing children’s logical thinking, problem solving skills and creativity. Students are encouraged to write programs using visual coding language Scratch, make interactive drawings and games and construct simple robots using littleBits sensors and switches. Classes for quick-witted and creative students who are willing to find out what is hidden in every device. During the classes, students develop prototypes for different electric circuits and devices using Arduino micro-controllers and supplement them with 3D models designed and printed by themselves. At the end of the program, students put their knowledge to test by creating their own technology solutions. What is the price for classes? Once per year: EUR 8 / class (30 classes, total per academic year: EUR 240). The first class is always free of charge. Is it possible to recover up to 20% of the amount paid for classes? Yes, it is possible. We are an interest-related educational institution registered in the Register of Educational Institutions, therefore, when submitting your annual income declaration, you can recover up to 20% of the amount paid for classes. Do I have to pay for a class if the student has missed it due to illness? Can I sign up my child for the Coding Club at any of your schools? The classes that take place in schools can only be attended by the students of the respective schools. For example, classes held at Riga Teika Secondary School can only be attended by its students. What shoud I do if my child does not study in any of Learn IT cooperation schools? Students who do not study at any of Learn IT cooperation schools are welcome to attend classes at Riga Business School (Rīgas Biznesa skola), Teikums coworking space or Riga Secondary School No. 34 (Rīgas 34. vidusskola) on Saturdays. Where can I find venue and time schedule for all classes? Clickhere to see the schedule of classes and find the most suitable classes based on your child’s age and prior knowledge. What can I do if I want to have a Coding Club in my city? If there is an energetic teacher in your city who would be interested in leading coding classes, a computer class available once per week and 15 curious students who are willing to learn coding, please contact Linda sending an e-mail tolinda@learnit.lv. We will do everything possible to bring the Coding Club to your school. What age group are your classes designed for? Our programs are tailored for students of grades 1-9. We offer different curricula for every age group taking into account the age and interests of children. Do students have to have prior knowledge in coding upon signing up for the Coding Club? We admit students without prior knowledge to all groups. If the child has prior knowledge in coding, it will be useful when working on individual projects during the program. Upon coordination with the head of the Coding Club, we offer a free-of-charge class during which the student can get acquainted with the learning process and make a decision regarding further participation in the classes.